The 2015-2016 APPA National Pet Owners Survey reported that 54.4 million American households have at least one dog. Although dogs are considered to be man’s best friend, dog-related injuries are more common than people think. 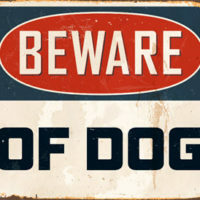 A 2013 ABC News report found “dog attacks cost Florida pet owners more than $7 million a year, and in some instances could lead to jail time.” If you are sued due to an injury caused by your dog, or if you have suffered an injury due to a dog bite, there are some basic information that will want to know regarding dog bite liability. The bitten person is in a public place or lawfully in a private place. It is important to note that the statute only specifically addresses injuries due to dog bites. A person who is otherwise injured by a dog may still be able to prove the owner is liable under a negligence theory by showing the owner failed to use reasonable care and that failure resulted in a person’s injury. Trespassing: As stated above, Florida dog bite law requires that the injured party was lawfully on private property. If a court finds the injured party was trespassing, this may preclude that party from collecting damages. Comparative Negligence: If a Florida court finds that an injured party’s own negligence partly caused the dog bite, the amount of damages the dog owner must pay will be reduced by a percentage equal to the percentage of blame assigned to the injured party. Florida law requires a person who suffers from a dog bite injury must file their lawsuit within four years of the date of the dog bite injury. It is important to keep this deadline in mind as a judge may throw your case out if it is filed after the deadline. If someone is suing you due to a bite or other injury sustained by your dog, or if you have suffered injury due to a dog bite, you will want to hire an experienced dog bite accident lawyer to help you understand your rights if your case goes to court. The personal injury lawyers at Lesser, Lesser, Landy & Smith, PLLC can go through key strategies and walk you through the litigation process. Contact us for your free initial consultation.